Peel the sweet potatoes and cut them into think slices. In a greased tin, arrange the sices on the bottom and sides of the tin. Bake for 10 minutes at 180°C. In a frying pan, fry the chopped onion and then cook the spinach separately over a low heat. In a bowl, mix the eggs, milk, turmeric, salt and pepper together. 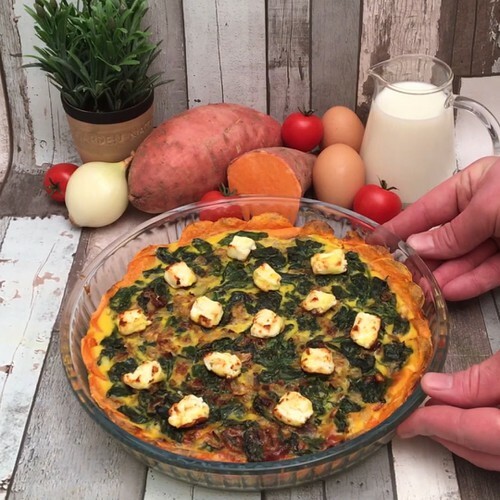 Place the cooked spinach and onion on the potato crust, then pour the egg mixture over the top. Cut the feta into pieces and arrange them on top of the mix. Bake for 35 minutes at 180°C, then enjoy.